Here is Ashley with her sweet family. How precious is Ava?! I can't wait to see who Judd favors. We had so much fun putting this shower together. Yes, it was a little crazy as each of us are pretty busy right now, but it came together perfectly in the end. I love this group of girls - they have become such sweet friends to me and they were great to do this event with! I am so sad, but we didn't get a group picture of the hostesses with Ashley. Everything just happened so fast, and we were all a little tired from the fun slumber party we had the night before. :) So this is the best I can do for a group picture - clockwise - Ashley, Angie, me and Jenn. Sheila, Ashley's SheShe Made business partner, also helped hostess, but I didn't get a single picture of her! Serious failure on my part. 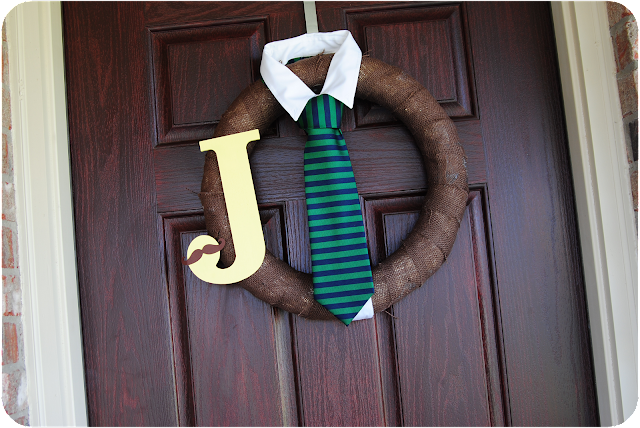 Jenn made this fun wreath based on this idea via Pinterest. Sheila made several cute tie onesies for a clothesline, and we hung some of them over the food table, and the others over another window in the main area. It was really hard to get a picture of all of these because of the back lighting in the room. These pictures don't do it justice at all - they were super cute! We had SO much yummy food! I seriously get hungry looking at these pictures. 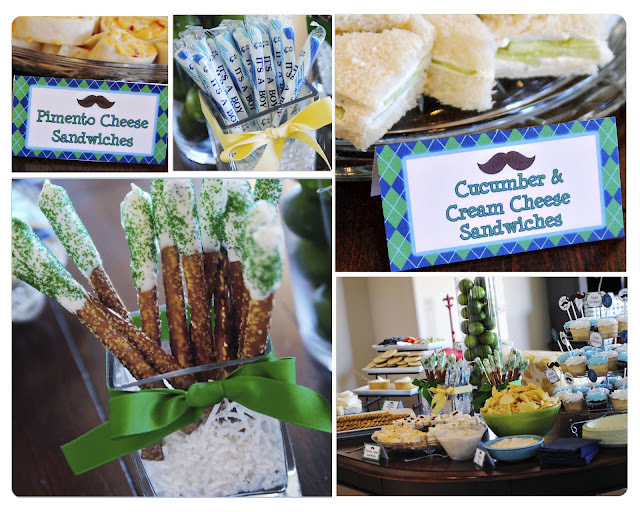 Ashley's mom was kind enough to help out with the food, and made some amazing pimento cheese sandwiches, as well as a few dips and hawaiian rollups...delicious!! Angie made cucumber & cream cheese sandwiches...seriously? Best things, ever! She posted the recipe on her blog, so be sure to check it out here. They are so good and simple to make! I saw the idea on Pinterest for miniature fruit pizzas, and I thought it'd be fun to make a miniature fruit pizza bar, where people could build their own fruit pizza. For the frosting, we just mixed a jar of Jet Puffed Marshmallow Cream and a block of cream cheese. It's simple and so good! I've also made these before using this recipe for the frosting. Oh and for the sugar cookies, we just used a roll of Pillsbury cookie dough. :) These were a hit! Nevermind the fact that I may or may not have been the reason they were nearly gone. We had plenty of delicious sweets! Jenn's friend Molly is THE best cookie maker. EVER. She made a few different designs - ties, Judd's monogram, a polka dot onesie, and a mustache. Not only were they adorable, but they are seriously the best sugar cookie I've ever had. And trust me - I've had my fair share of sugar cookies. If you are in the DFW area and ever need cookies, she's the person for the job! Her email address is welovetheperfectparty at gmail.com if you'd like to contact her. 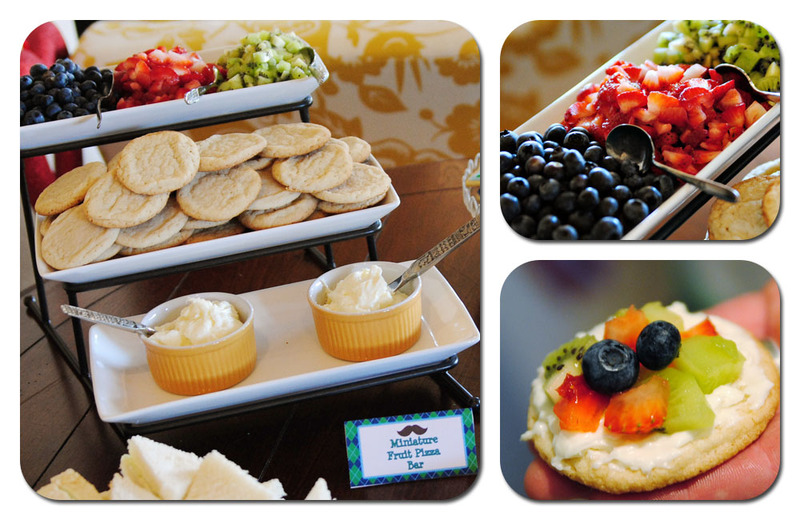 We served cucumber & blueberry water, sweet tea, and punch to drink. They were all SO good! 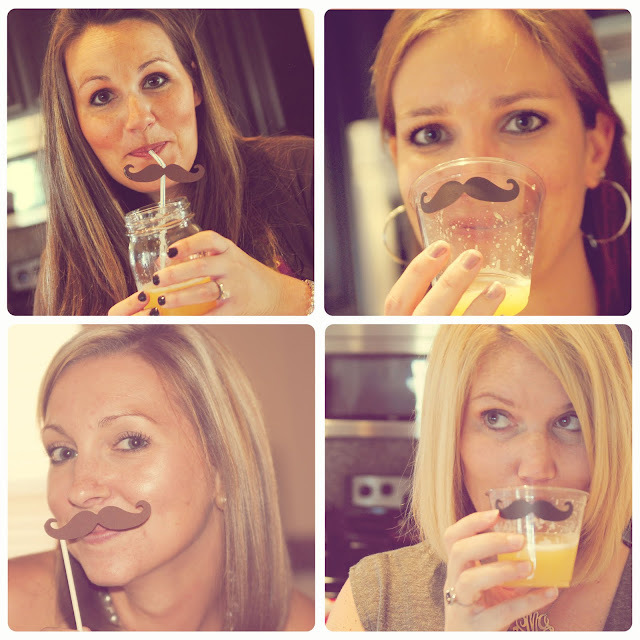 I cut a few mustaches on my cricut, then we just taped them to straws. I also cut some mustaches on vinyl to stick to the cups for a fun touch. So adorable Sarah!! I love the mustache theme! So cute AND creative! I can't even pick my favorite detail b/c the entire event looks just perfect! Great job!! i absolutely LOVE how everything came together!!! FAB!!!! 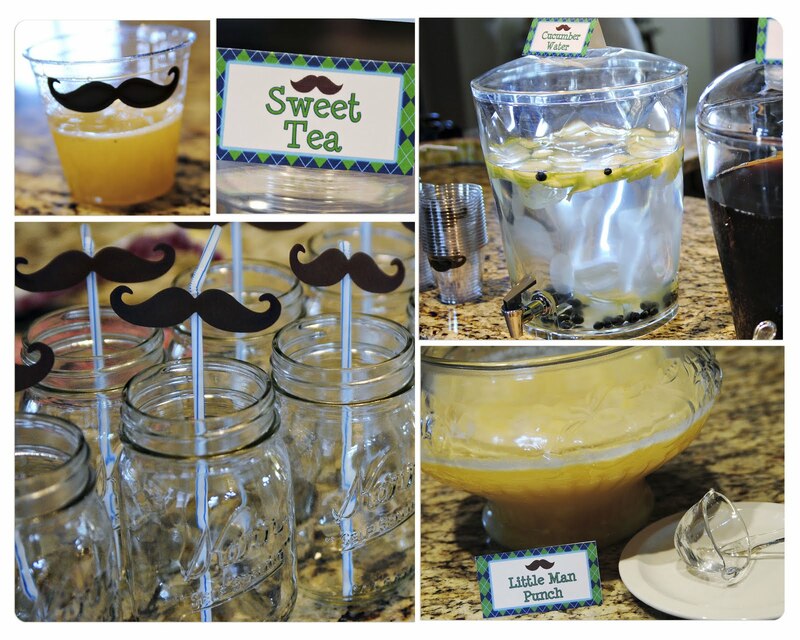 love love love the mustache on the cups! SO FUN!!!! You create the best parties! Great job, looks awesome! At first I didn't recognize you because I had forgotten about your super cute haircut (: I think my favorite parts are the presentation of all the food and the mini fruit pizzas idea. I'd love to follow you on Pinterest! Can you link your boards to your blog? It's so, so cute!! Looks like such a fun time too. I love all the details! Everything is so cute!! Those cookies look amazing!! It all turned out great!! Thank you for sharing!! That wreath looks just adorable. Oh my!! So awesome!! Can you be my friend? ha ha! I am so lucky to call you my bestie. Thanks again for everything!! Judd also says "Thanks Auntie Sarah". The wreath is brilliant!!! Adorable party as always!! Love your version of my Father's Day wreath!! 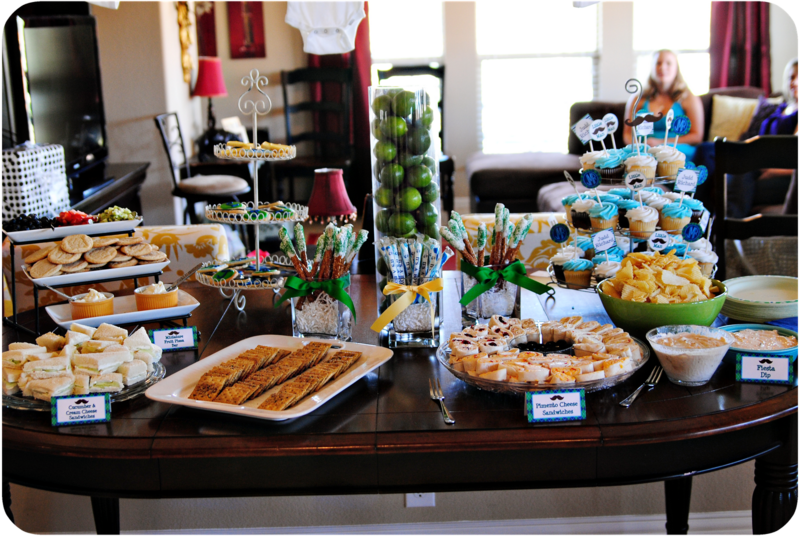 such an adorable baby shower! I might have to steal that idea for the fruit pizza one day that is wonderful idea! how cute! you're so creative! Can I get your fruit pizza "secrets?" What cookie recipe did you use and what is the recipe for the frosting? Where did you get the sticks that are in the cupcakes? LOVE that! I would like to have the contact info for the girl that made the cookies. Thank you so much! 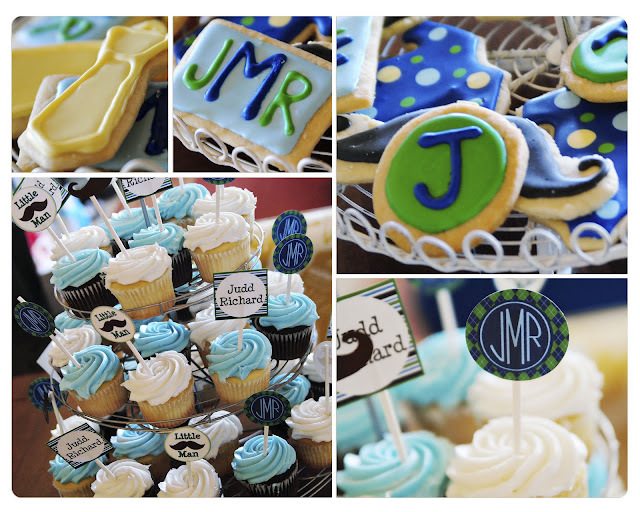 If you're interested in ordering cookies from the lady we used, her email address is welovetheperfectparty@gmail.com. She does an excellent job! 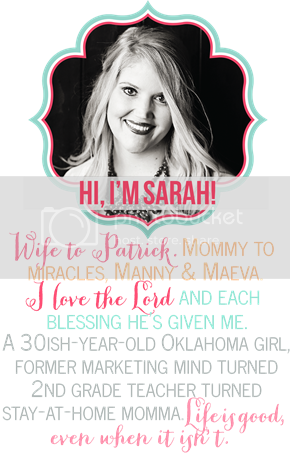 Do you sell your invitations or the pdf? I am really really interested in all of the designs for this party and wanted to order...please email at michellesagray@yahoo.com if you can. thanks so much! LOVE LOVE this!!!!! so creative!!! I love this how did you make the place cards? What template did you use? I also love the invitations! I am just starting to plan a baby shower for my sister. I would love to know where you got the invitations, or did you make them? 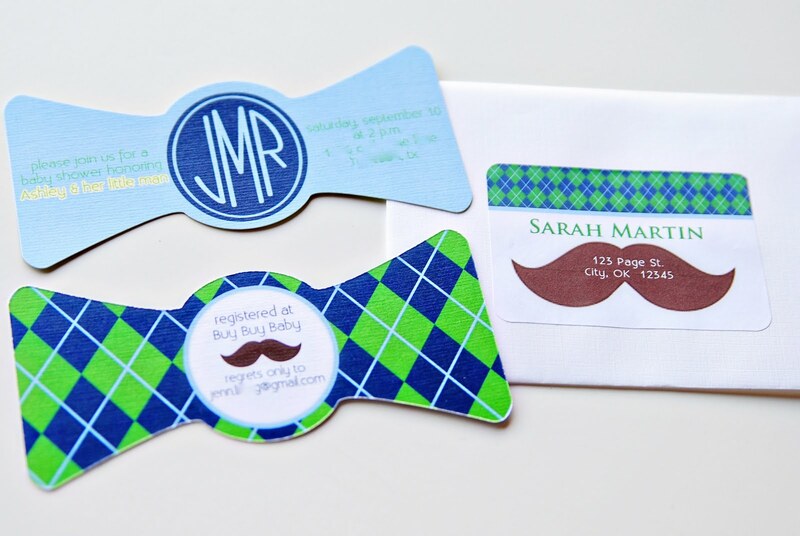 I as well love the invitations, any way I can get this information on ordering them or getting the PDF for them? Thanks and keep up the great blog!